SphereCrash is a fast paced color matching arcade game. 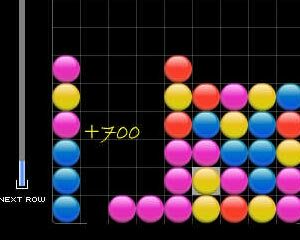 The objective is to crash or remove grouped or connected Spheres of the same color from the game board in order to accumulate points and avoid the Spheres to reach the top = game over. Eliminate Spheres by clicking on two or more connected spheres of the same color. Copyright © Games-Games.com 1997-2003. All Rights Reserved.